We are able to offer a stump removal service. 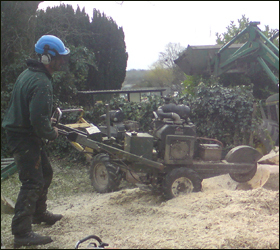 This is usually carried out by using one of our stump grinders, one of which was specifically made to fit into spaces with small access. The stump grinder has a cutting wheel with tungsten carbide teeth which revolves at a high speed and cuts the stump and adjacent soil into small pieces. After grinding the stump below the surface, the bi product from the stump consists of a mixture of soil, wood and stone. We are able to remove the bi product and replace with top soil. Would like a quote, or just wish to enquire about a matter of interest than give us a call. © 2011 Copyright G.Bridgland ltd. All Rights Reserved.